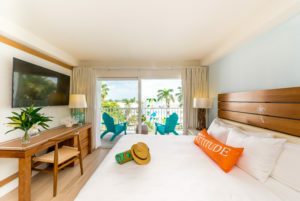 The accommodations, with color palettes derived from the hues of the sea, feature a wet bar and in-room refrigerator, microwave (upon request), 55” LCD flat-screen HDTVs, laptop-sized safes, Keurig® coffee makers, iron/ironing boards, workspace complete with a desk and complimentary high-speed Wi-Fi. The 8,500-plus square feet of meeting space is a new addition to the resort and a design juxtaposition of formal meets fun. White wainscoting throughout complements the statement carpet, which is Caribbean blue with blurred and overlapping lime and burnt orange sand dollars. The highlight is the nearly 4,700 square-foot ballroom, which is already a sought-after venue for weddings and special events. Complementing this is the pre-function area (2,112 square feet), four breakout rooms and an executive boardroom (377 square feet), all boasting 14-foot ceilings. One of the most noteworthy and significant changes to the resort is the addition of three new restaurants, including a signature eatery, Eating House 1503 by award-winning chef, author and TV personality Roy Yamaguchi. 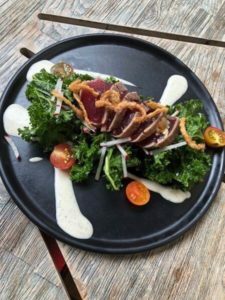 A spin off of his Eating House 1849 in Hawaii, Yamaguchi’s first Caribbean restaurant will highlight an eclectic menu ranging from steak to sushi, ramen, wild boar-blended cheeseburgers. 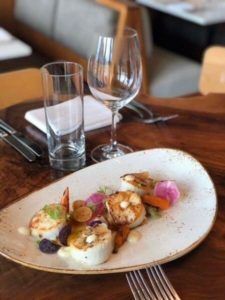 It is a fusion between Hawaii and the Caribbean’s finest seafood, with a fun twist that is reflective of an island escape. The name pays homage to the year the Cayman Islands were first spotted by Christopher Columbus, 1503. The focal point of Eating House 1503 will be the bar with antique mirror tiles, reclaimed wood, a rodi-quartz countertop and 16 floating-back barstools. Diners are greeted by a glass frameless door at the entry and orb lights that flow evenly throughout the space. The layout of the restaurant was extremely purposeful with every seat intended to give the “best-seat-in-the-house” feel, according to Barry Hutchinson, interior designer and architect. Also new, Frank + Lola’s, located off the island’s only open-air lobby, serves up specialty pizzas, homemade ice cream and gelato, and a signature “spiked Italian soda” menu all day long (11:00 am to 10:00 pm). All of the 10” pies feature homemade dough, sauce and ingredients imported from Italy. Rounding out the trio of new eateries is Spread, which is a deli-meets-wine bar-style café. Consulting Chef Sean Brasel of Meat Market teamed up with the resort team to deliver a menu that highlights artisanal sandwiches, salads, house-made pastries and macaroons, freshly squeezed juices and many healthy options. There will be a retail section within Spread that features local treats from pepper jelly to rum cakes for guests to enjoy in their rooms or take home. 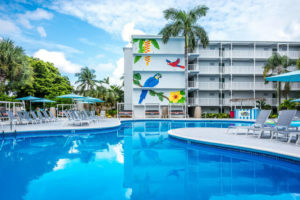 Guests will also enjoy four pools, one with the swim-up 5 o’Clock Somewhere Bar & Grill, License to Chill® lobby bar, and activities to keep busy from morning to night. From corn hole to and snorkeling to kayaking, paddle boarding and bicycling, all are complimentary for guests to enjoy. And if doing nothing at all is what is on the day’s to-do list, floats and tubes are readily available for lounging, as well as plenty of chaise lounges both poolside and on the beach. 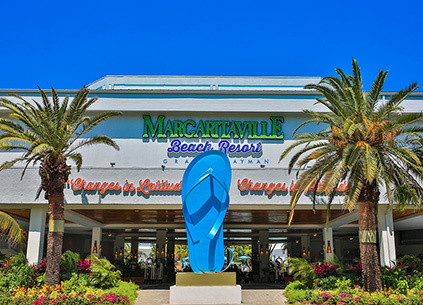 For more on the new Margaritaville Beach Resort Grand Cayman, or to make a reservation, visit www.margaritavilleresortgrandcayman.com or call (855) 640-6440. Guests can also keep up with the resort’s happenings on Instagram and Facebook.